Children act out a story in the classroom. – Meryl Goldberg, Integrating the arts: An approach to teaching and learning in multicultural and multilingual settings, Pearson, 2006. 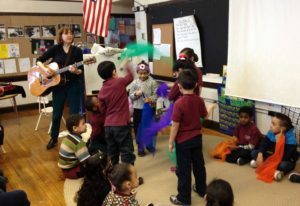 Another way I use music to enhance story knowledge is with a song I wrote with a PreK class at Boston’s Gardner Pilot Academy. The students were in the midst of a unit on fairy tales and their favorite story was the Three Little Pigs. Adding music enhanced their learning in several ways. First, it engaged the students in learning about music itself, specifically about opera and the blues. The students helped select two song styles for the mini-opera: one was a folk-styled little pig theme and the other a rock/blues big bad wolf theme. Both themes were repeated several times – as they are in the story – so the children soon felt very comfortable singing the simple lyrics. Teachers can undertake these kinds of story/music projects with the help of a music specialist, but most would be relatively easy for classroom teachers to do by themselves. The Royal Children song is simple to sing and can be done without any instrumental accompaniment, and teachers could always use my CD for the Three Pigs activity. Here is a link to a video in which you can see some kids acting out The Three Piggy Opera: https://www.youtube.com/watch?v=5yUs7qJanOE This can quickly become a favorite activity that kids will stage spontaneously – no teacher required! This blog post is a “reprint” of an earlier entry. Stay tuned for a new post coming soon!